It’s day 2 of our belated honeymoon in Copenhagen, and as expected, the food situation is outstanding. Perhaps the consistent predominance of umami flavors in Japanese cuisine has been getting to us, but this change in flavor profile of Scandinavian cuisine has been nothing short of welcoming for our palettes. From the handful of meals we’ve had here thus far, generally we’ve noticed that a heavy handedness of acidity in the dishes. It brings such a lovely brightness to the food which we didn’t realize we’ve so desperately missed until now. 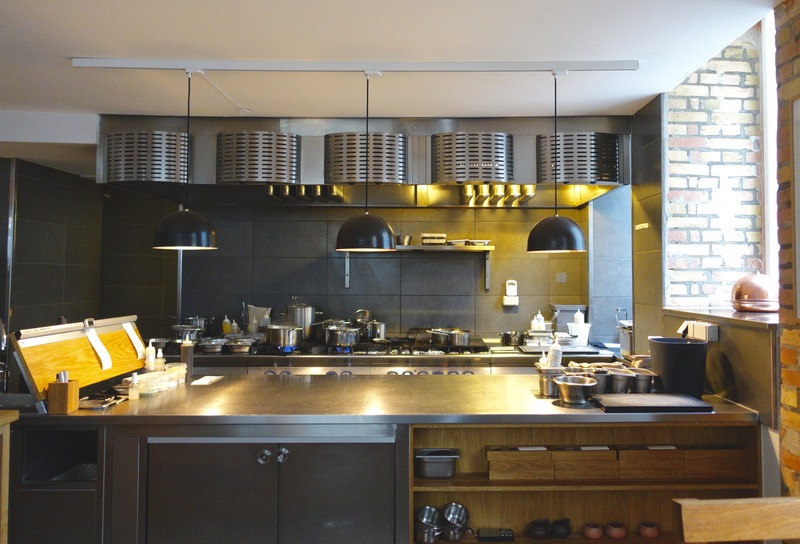 Restaurant Relæ is no different. 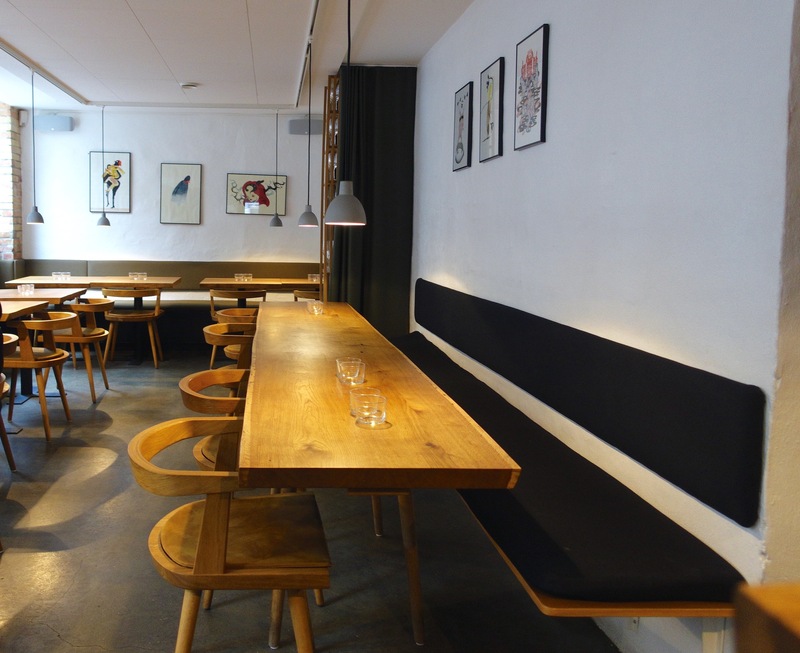 From the start of our Copenhagen trip planning, we knew Relæ would be high priority. 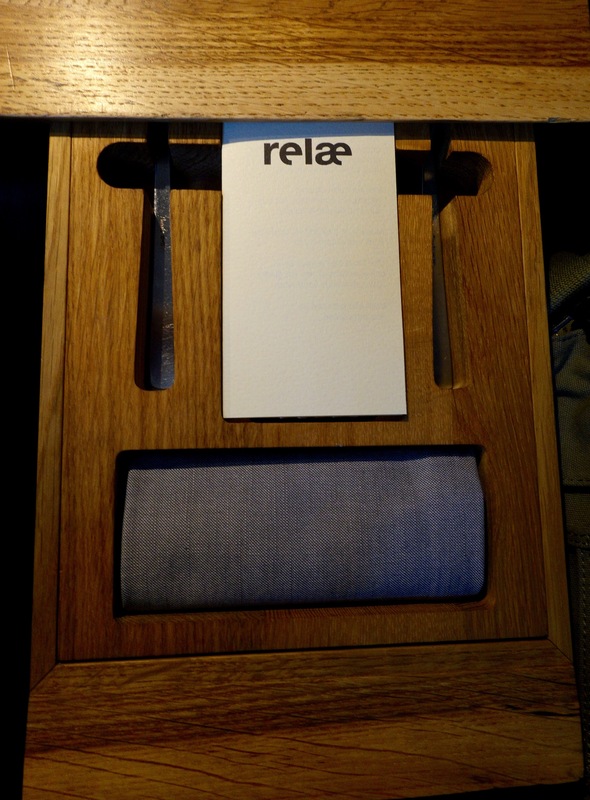 Mr. S. gifted me with the Relæ book when it first came out, and eating here has been on our minds since. Even several chefs we spoke with put Relæ ahead of another acclaimed Michelin-starred establishment (ahem.. Noma). 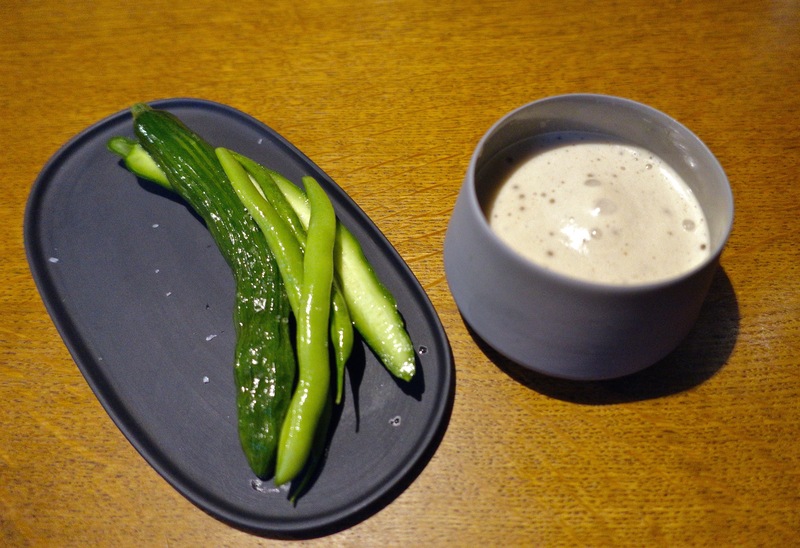 Perhaps, it’s just so darn impossible to get into Noma nowadays, or perhaps there are plenty (and I mean a myriad) of other fantastic contemporary Nordic restaurants that are getting more and more attention (many of which are helmed by Noma grads). 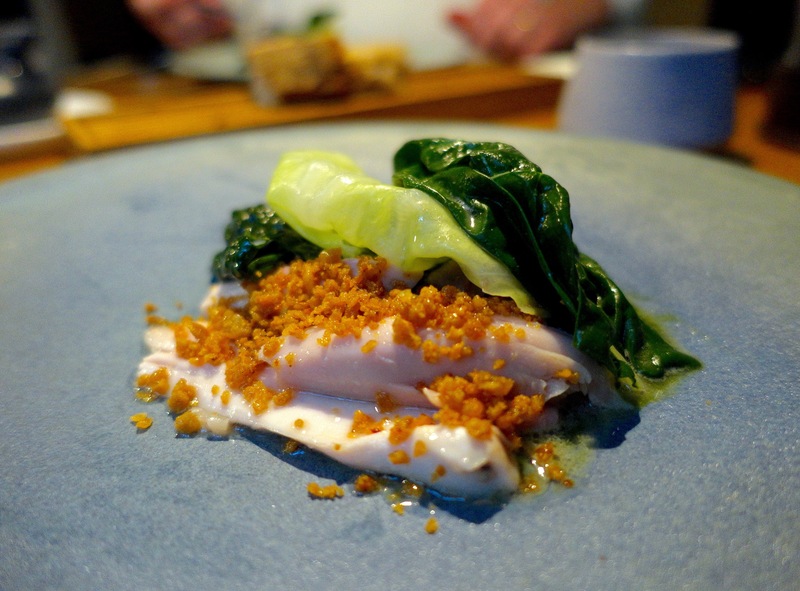 But food enthusiasts are realizing that Copenhagen has a rich abundance of wonderful restaurants run by chefs who forage and hunt, and care passionately about ingredients, technique, and flavor. And, are much easier to score reservations at. 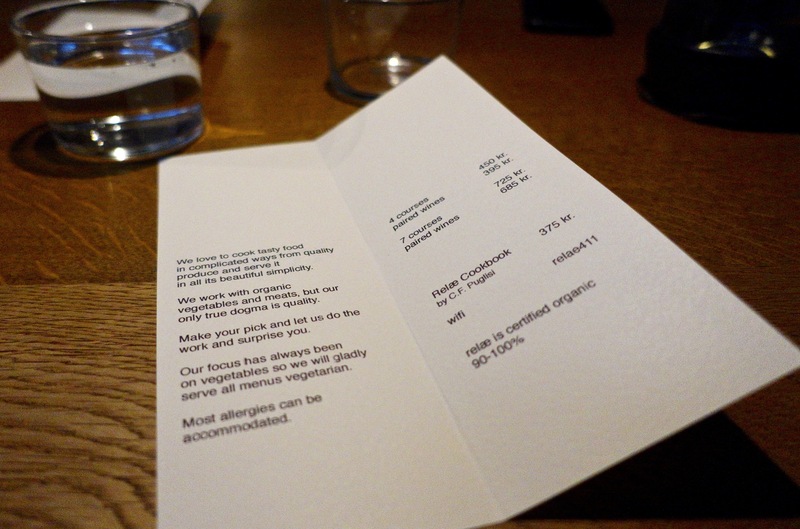 Which we did get at Relæ–the first seating for dinner tonight at 5:30pm, and we each chose the 4-course tasting. 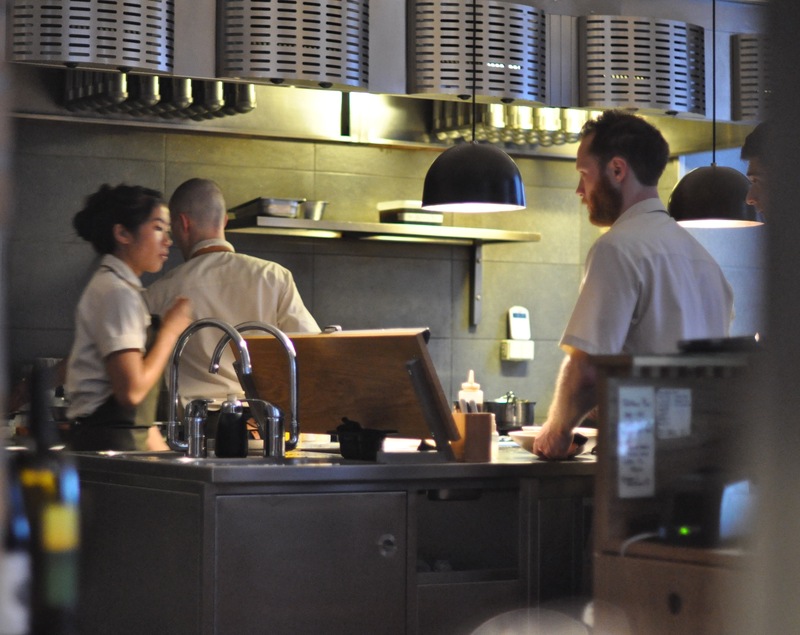 The completely unpretentious, almost casual, setting of Relæ makes it incredibly approachable as a fine dining establishment, and made our dinner experience extremely comfortable and laid-back. Indeed, as we dined to the upbeat tunes of Vampire Weekend in the minimally-decorated surroundings, next to fellow diners whose tables were mere inches from ours, we felt at ease to chat with others, the staff, and take plenty of pictures. 5:48 PM: After we sat, we were informed by the staff that the menu and silverware could be found in a drawer of our table. We each pulled on a handle in front of us to reveal a crisp sheet with a simple menu offering a 4-course tasting or 7-course tasting. 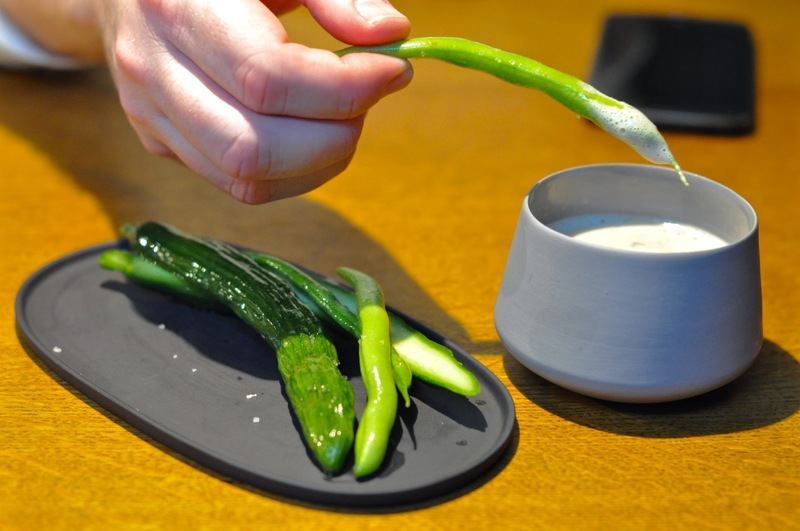 5:52 PM: A snack from the kitchen arrived–baby cucumbers and green beans with a Bagna Cauda sauce. Both vegetables were crunchy and snapped with each bite. The sauce had a mild anchovy flavor and was nicely aerated to keep it light. 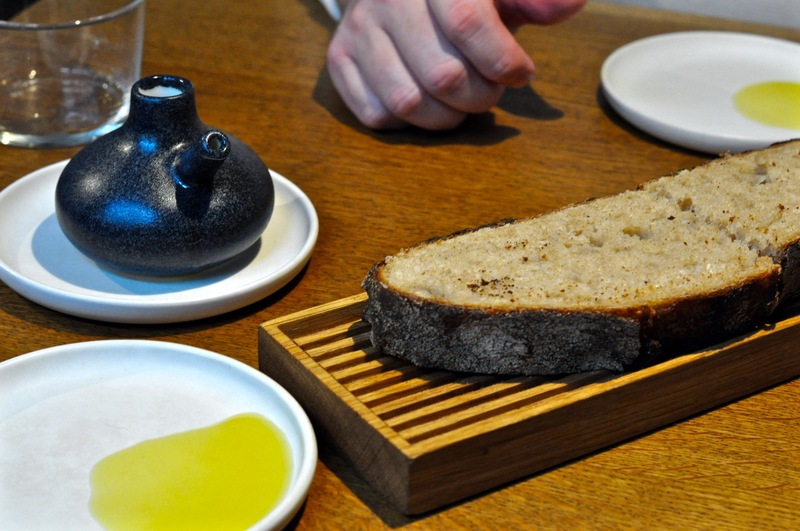 6:03 PM: Sourdough bread and Sicilian olive oil for dipping. Nice tanginess to the bread with good chew and thick, crispy crust. Lovely, floral olive oil. 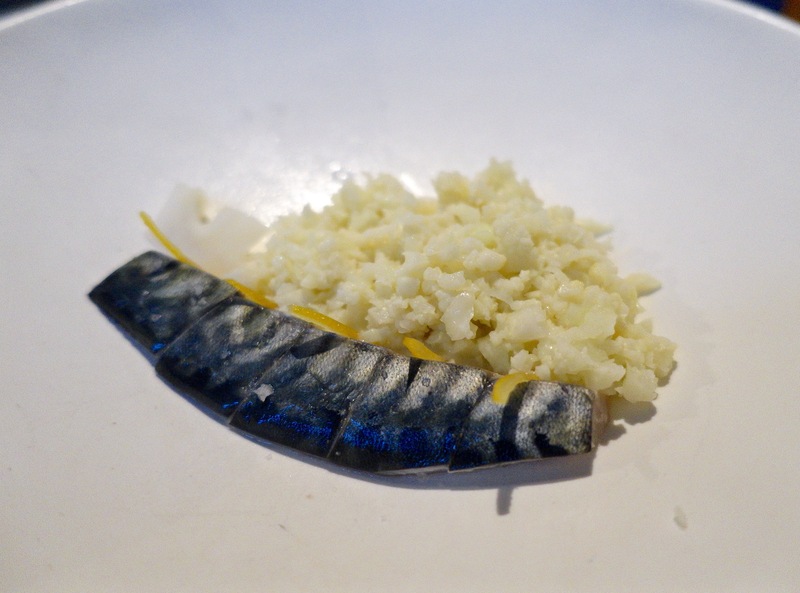 6:10 PM: First course–Danish salted mackerel with cauliflower “couscous” and salted bergamot and lemon rind. My favorite aspect of this was the cauliflower which had a slight cream sauce as the base. The bergamot was subtle and did not overpower any of the other delicate flavors. 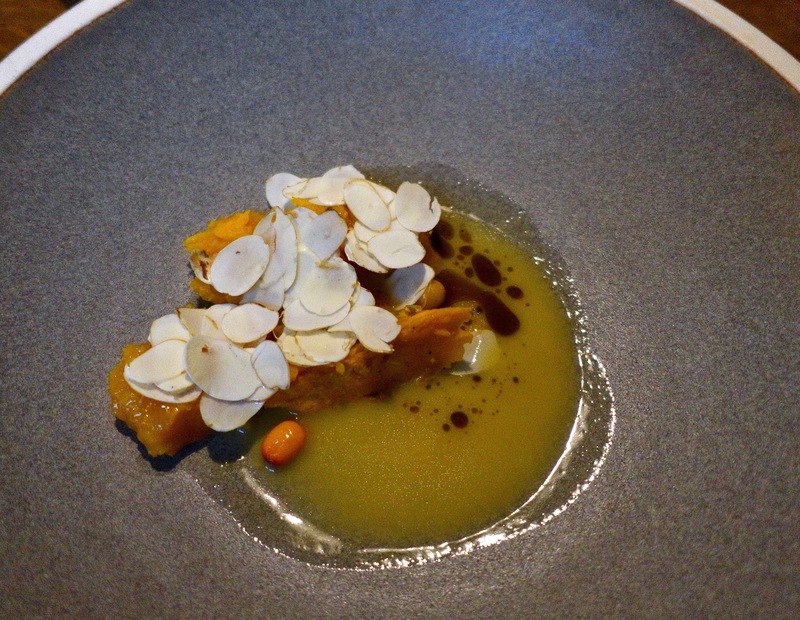 6:24 PM: Second course–Baked Hokkaido pumpkin with almonds, sea buckthorn berries, and beurre blanc. Favorite dish of the evening. 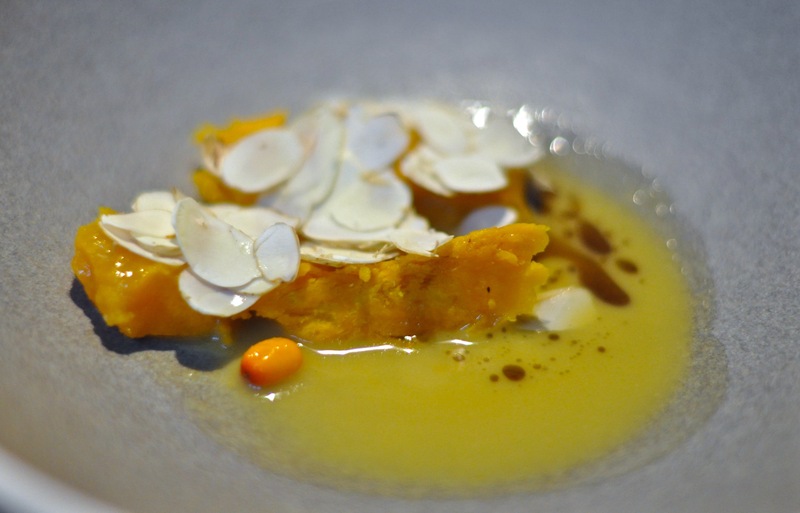 The beurre blanc and sea buckthorn berries were extremely tart, which balanced out the inherent sweetness of the pumpkin. A few drops of browned butter added a delicate nuttiness that lasted on the palette. 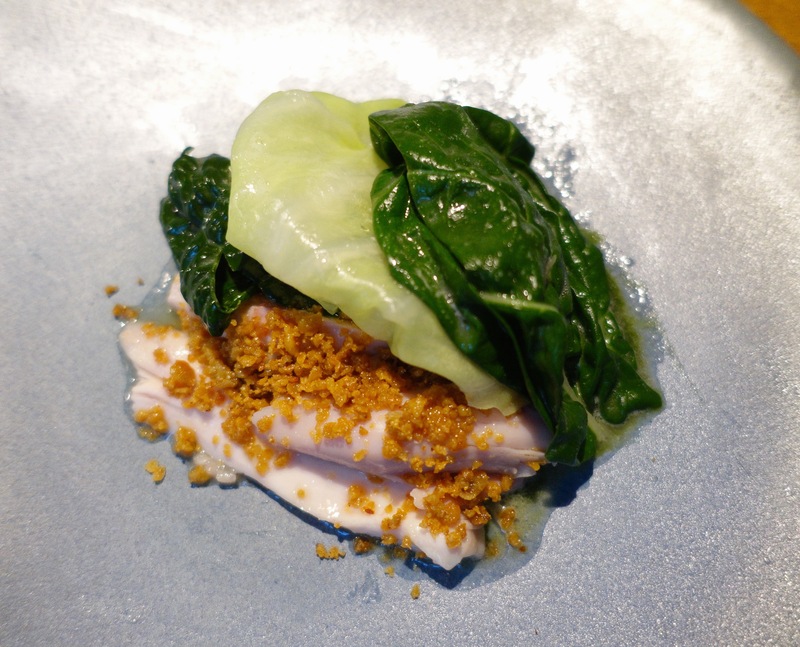 6:45 PM: Third course–Sous-vide chicken (for 2.5 hours) with chicken liver, heart, and skin, served with pickled gooseberries, crumbled chicken skin bits, and 3 lettuces. Chicken was so tender and juicy, so much so it resembled almost a raw texture. What I loved most was the addition of liver and heart which added an earthiness and funkiness to the dish giving it a multi-dimensional meat flavor. Layers of texture here–from soft and juicy, to fibrous (lettuces), to crunchy (chicken skin). 7:12 PM: We were offered a cheese course. We declined. 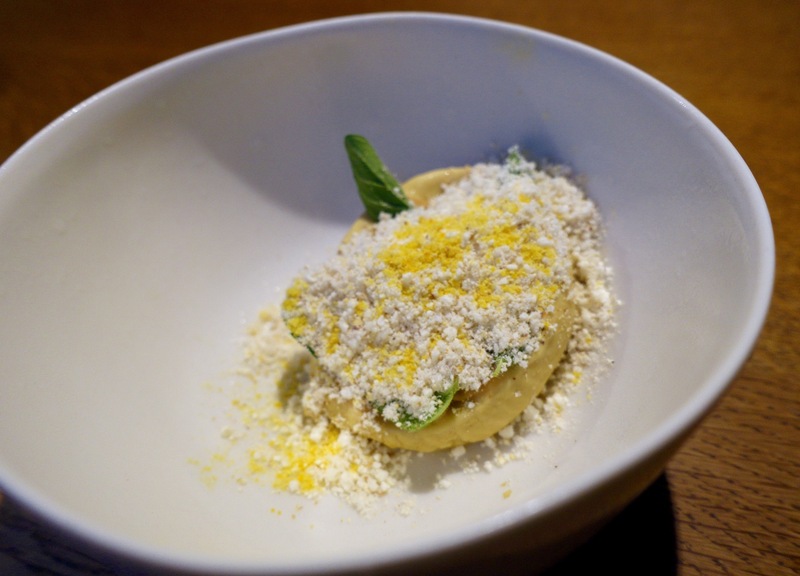 7:18 PM: Fourth course–Roasted corn ice cream with oregano leaves, salted apple-vinegar caramel, and popcorn powder. Incredibly interesting dessert concept due to subtle sweetness, while a strong corn flavor was predominant. I wasn’t a big fan of the texture here, since the powdery popcorn took away from the creamy, smooth ice cream texture. 7:47 PM: We left full and happy. Reservations are a must. Try to book at least 3-4 weeks in advance of your preferred date.